← End of summer update . . .
Our event, held on a wet and windy evening earlier this month, was deemed a great success. Over a hundred residents and others, came to the Baptist church to see the display of progress with the station and community hub and ask questions of group members. 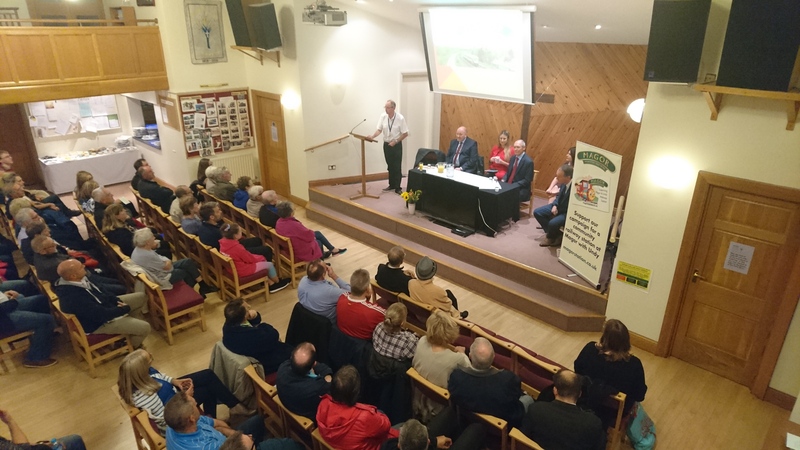 Later in the evening, introduced by MAGOR chairman, Laurence Hando, a range of politicians and authorities gave their views and enthusiastic support for the innovative approach of the ‘Walkway’ station project. These included; John Griffiths AM, Peter Fox (Leader of Monmouthshire County Council), Kellie Beirne (Director of Cardiff Capital City Region Deal), Sophie Howe (Future Generations Commissioner for Wales) and Paul Matthews (CEO of Monmouthshire County Council). Paul gave the community his inspirational view of the project and concluded with the memorable phrase that the station was no longer a question of if but when! The whole proceedings were reported in the South Wales Argus here. Only one other thing to report this month – we now have a date in November for our next meeting with the boss of Transport for Wales, James Price, to update each other on the Magor and Undy Walkway project and other associated transport plans.